This time of year is a good time to pause and take stock of the bright spots of the year gone by.And this year, the year-end assessment has been a particularly rewarding experience… including some discoveries that top anything I’ve seen over the past 15 years. Take a look at my best and most-surprising discoveries of 2015. I’ve never seen such a trove of genuine, Spanish-colonial homes. By “genuine,” I mean houses built during the Spanish colonial period, rather than being built more-recently in the Spanish colonial style. In case you’re not familiar with the style, a typical Spanish colonial can be rather plain when viewed from the outside, with its rooms built around a large center courtyard… which is often adorned with trees, flowers, and sitting areas. The houses will have a main door to the street, through which you can normally see inside to the courtyard. The house’s rooms open onto the courtyard, which is the primary means of getting from one room to another. In addition, some rooms often have interior doors allowing you to pass directly from one room to the next. Many colonial homes in Álamos were built in the late 1700s, well prior to Mexico’s independence. One house we looked at had its title on file in Seville, Spain, the municipal capital at the time the house was built. And when combined with the low prices, a strong buyers’ market, and the amazing local and expat communities, Álamos should really get your attention. 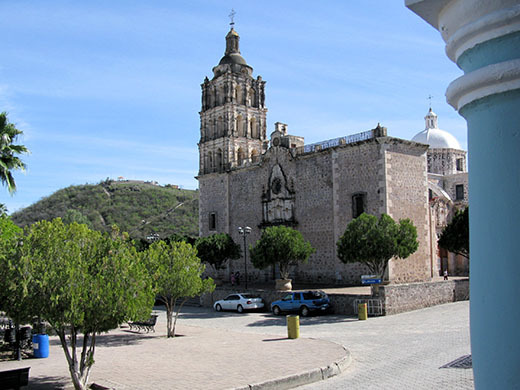 Álamos is a small colonial town of less than 25,000, nestled in an inland valley surrounded on all sides by endless mountains and beautiful, wild countryside. It was founded in the late 1600s, after silver was discovered in the area. The huge wealth generated by the mines allowed the residents of Álamos to build dozens of colonial mansions and hundreds of colonial homes throughout the downtown. The silver eventually ran out, and the silver barons and their crews moved on. Álamos began to decline after Mexican independence from Spain, and most of the old mansions, hotels, and beautiful municipal buildings fell into ruin. Álamos was declared a national monument in 2000 by President Zedillo, and was named a Pueblo Mágico in 2005. The latter is a designation reserved for towns that offer a “magical” experience, thanks to their beauty, historical significance, and cultural riches. 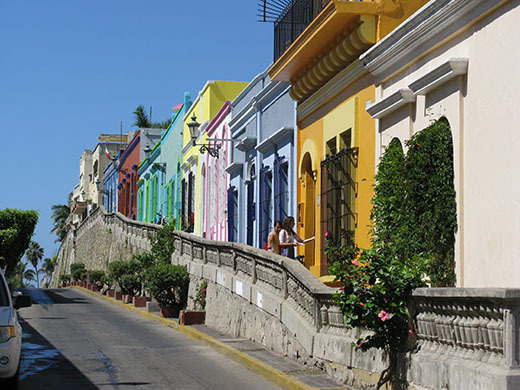 Today, Álamos has recovered and retained its original 17th century charm, with stately colonial mansions, cobblestone streets, narrow alleys and passageways, a magnificent church, and a beautiful town square. What’s more, during my experience of scouting retirement destinations since 1998, Álamos is the best place I’ve found for a single woman moving abroad on her own. Women on their own are not only welcome… they’re at the foundation of the expat community. So Álamos makes the list for its large, well-restored Spanish colonials, at reasonable prices, in a beautiful mountain setting. Follow this link to read more about Álamos and to see some property examples. This year was not my first visit to Chile, or even to Santiago. But it is the first time that I settled in to Santiago for an extended stay… and the first time I’ve seen Santiago at these low prices. From our apartment in Barrio Italia (part of Santiago’s well-known Providencia district), we were able to walk to dozens of restaurants and cafés, and a well-equipped gym… not to mention a fully stocked supermarket and a modern shopping mall. Best of all, the fast, inexpensive subway system gave us access to the entire metropolitan area within minutes… a benefit that we took advantage of frequently. Chile has an honest culture with low corruption… on par with the U.S. In fact, my only complaint about Chile over the years is that it’s been expensive by Latin American standards… a good value for the lifestyle perhaps, but expensive in an absolute sense. That’s no longer true today… Chile’s a bargain for the lifestyle you’ll enjoy. At today’s exchange rate of 707 pesos per USD, the dollar-holder has an amazing 47% more buying power than we had as recently as 2013. 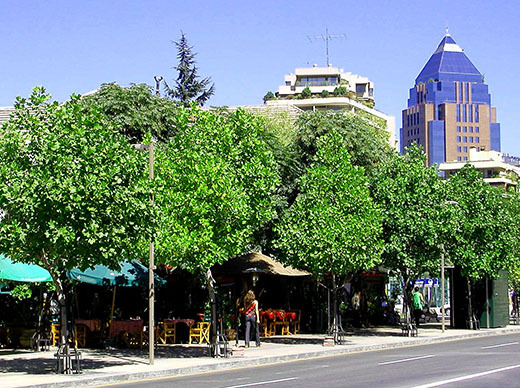 Follow these links to see my previous articles on Santiago’s top two residential sectors, and a study of Santiago’s rental returns. Keep in mind that the exchange rates are even more favorable to the dollar-holder than they were at the time these articles were written. So, Santiago makes my list for offering sophisticated, First World city living that is now within reach, thanks to today’s low prices. My most significant surprise for 2015 was in Mazatlán—where I am writing from today. Mazatlán offers an amazing 20 miles of sandy beachfront. And unlike many of its seaside competitors the beachfront is open and accessible with a wide, new boardwalk. And somewhat uniquely it also offers a large, colonial historic center starting at the waterfront, where many expats enjoy Spanish-colonial city living with an upscale twist… thanks to the wealth of restaurants and cafés. Prior to visiting earlier this year, I’d heard that the historic center had recently been refurbished, and indeed, I found the finished parts to be very attractive at the time. But the real surprise is what’s happened since I left here in March… the town is exploding. The “fixed up” part of the historic center is expanding rapidly, and scores of formerly tumbled-down homes are now brightly painted and undergoing restoration. And I’ve only been gone eight months. What’s more, the streets are being restored, and the sidewalks are being rebuilt and widened by the city. Real estate—in a long-term slump last March—is now taking off… at least in sales volume, if not in prices. Local realtors are hiring staff to support buyer traffic that they haven’t seen in years. On the beachfront, hotels are at capacity, with eight new hotels under construction (with six more permitted). So, Mazatlán is at exactly the right point for a property buy. And best of all, current exchange rates are making everything here a bargain. I’ll give you a complete update on Mazatlán next week, but for now, you can see my previous articles on Mazatlán’s historic center and Mazatlán’s beachfront areas. Mazatlán makes my “best of” list for the best near-term opportunity of the year, with a big potential starting in 2016. I still have my perennial favorites, like Medellín, Colombia, and Montevideo, Uruguay. But this year’s discoveries of Álamos, Santiago, and Mazatlán made all the travels of 2015 worthwhile… and are doing their part to make 2016 a good and profitable year. Has anyone in the Live and Invest community developed a spreadsheet to compare possible rental properties? 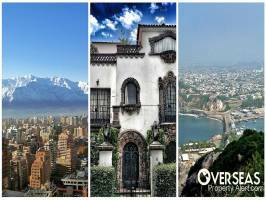 What area of Medellín is most recommended at this time for buying rental properties? When I got this question the other day, I sent Brett a spreadsheet directly. It’s not from Live and Invest Overseas, but rather one I made for personal use. I have some properties on it, which are actual properties I looked at in 2012. If you’d like a copy, you can download the property spreadsheet here. And follow this link for a quick rental return calculator. In both cases, make sure you enter the current exchange rate… the sheet will adjust all dollar values automatically. As to the gringo pricing, the only way to know you’re getting fair prices is to use more than one agent… preferably, including some local agents who are competing in the local market. I’ve purchased a couple of properties from Marjorie White, who can be reached at mayowr@une.net.co. I recommend Marjorie highly. She understands a lot of English, but speaks only Spanish. As to location, I’d still focus on properties that are an easy walk to the Golden Mile, as well as to Parque Lleras/Zona Rosa, if you can find them. You’ll get potential expats, business travelers, online workers, and people in town for tourism.